Special tailored child-size Arqua Fountain, in Bondi Blue. Keeping an eye on the kids climbing the tower, from picnic tables in the shade. 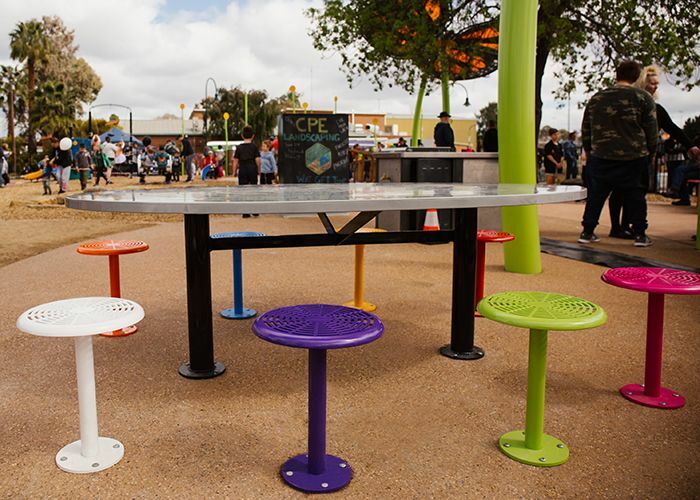 In the 'Where Angels Play' junior area, custom oval tables paired with Cafe Stools. The custom Mulga Bill climbing tower and slides. To the right, the 'Silver Streak' tumblers and slide. 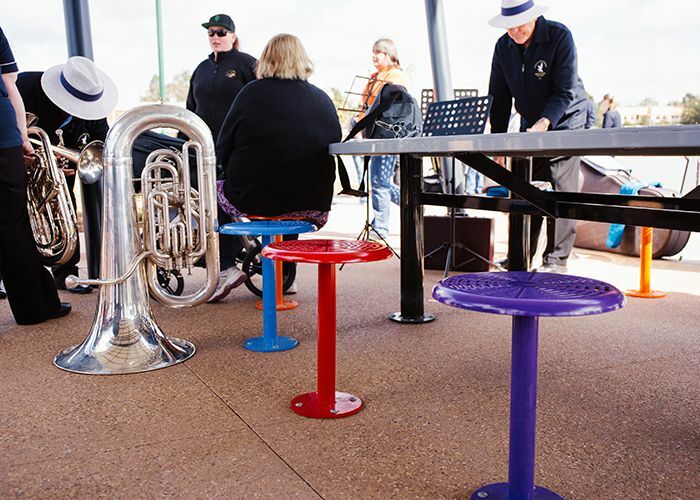 Custom oval tables feature an eaglehawk design, paired with 80 colourful Cafe Stools. 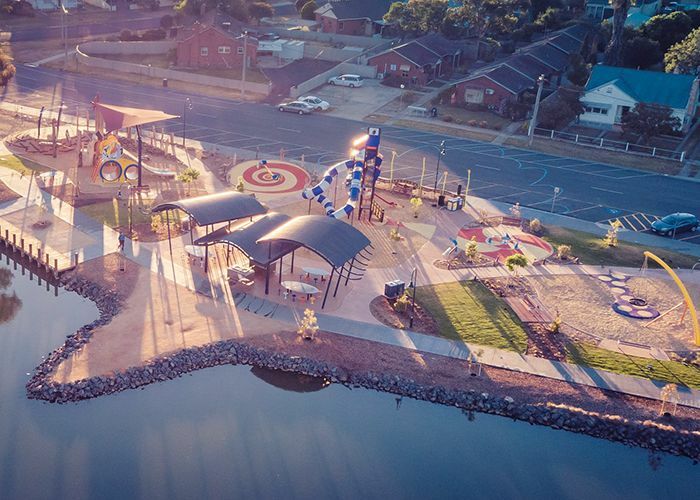 The play space is shaped like an eaglehawk, seen from the air. Special tailored child-size Arqua Fountain, in Bondi Blue. Photo: Bendigo Aerial. The band at the park's opening ceremony. 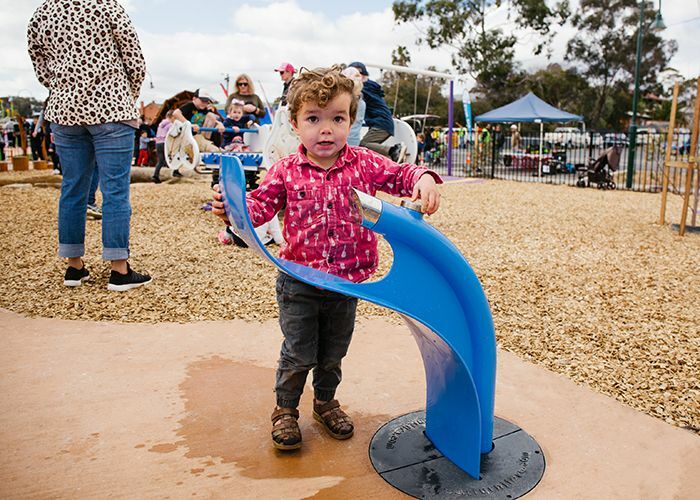 Eaglehawk’s $1.3M play space is inspired by the Banjo Paterson poem ‘Mulga Bill’s Bicycle,’ featuring a series of adventure zones for children to test their skills. 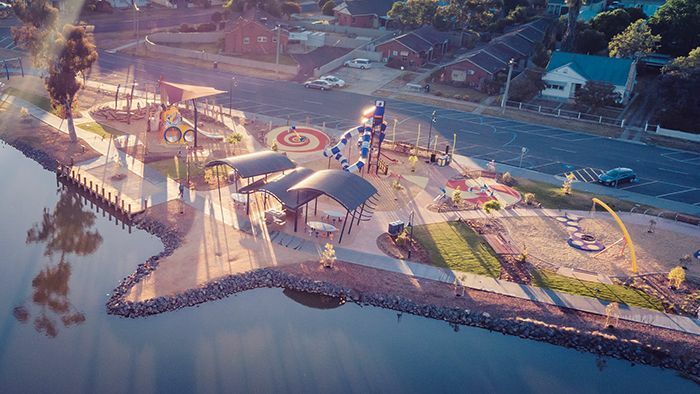 The eaglehawk-shaped playground, built beside Lake Neangar, is designed by City of Greater Bendigo’s landscape architect Gary Lantzsch. The space explores storytelling through landscape architecture, he tells StreetChat. 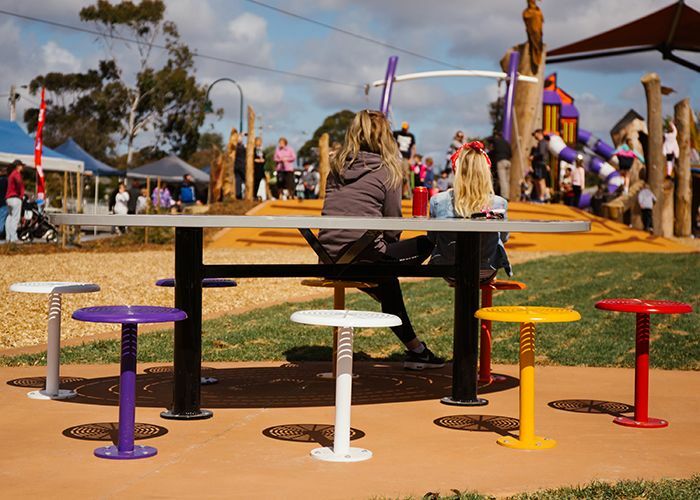 Paterson’s poem begins, “Twas Mulga Bill, from Eaglehawk, that caught the cycling craze”; and Lantzsch’s playground dramatises the home-grown hero’s misadventures with custom play equipment, artwork and activities. It is also an opportunity to influence children into enjoying reading and associating it with play. 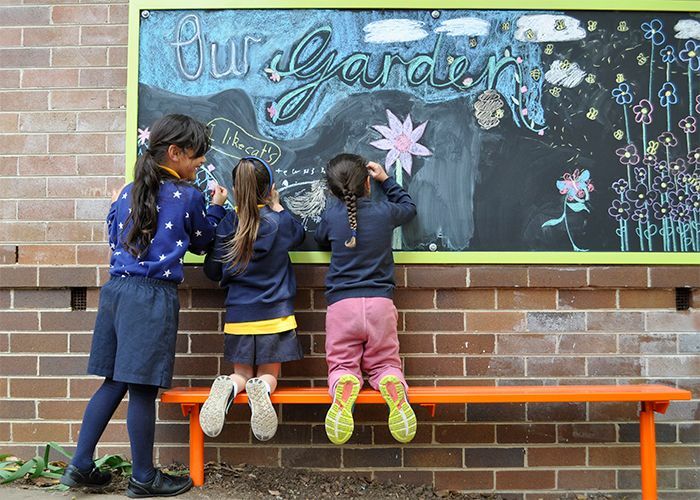 The designer received permission to use the 1896 poem and iconic illustrations by Kilmeny and Deborah Niland from the 1973 edition throughout the playground. 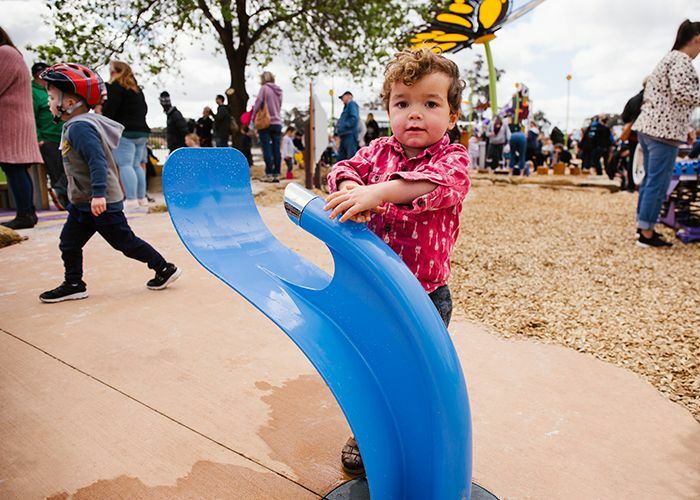 The park begins at the junior end through butterfly-decorated gates called ‘Where Angels Play’, a play area to celebrate the life of baby Zayden Veal-Whitting. 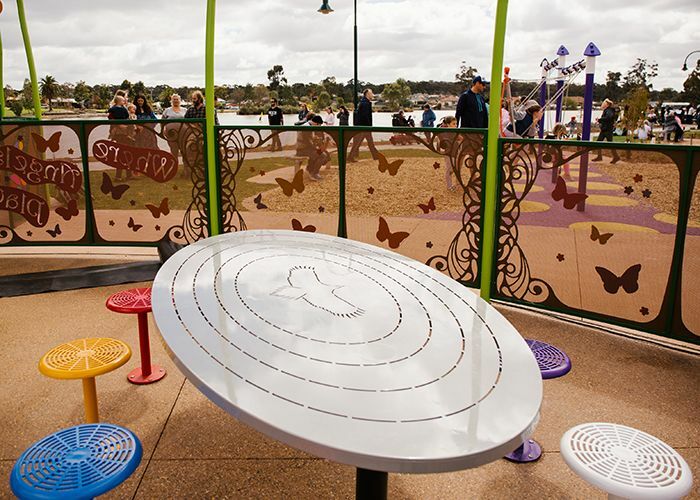 Butterflies feature prominently in this area to represent a hopeful symbol of renewal and transformation. 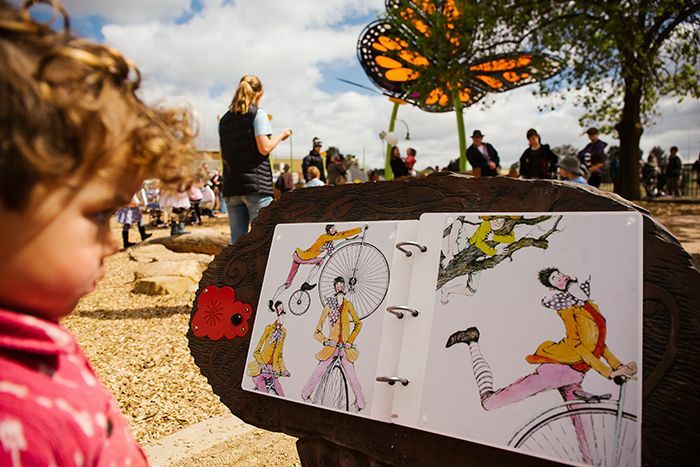 Young children can sit in a storyteller’s chair carved from an old ironbark stump by a local artist – a reference from the first page of the Mulga Bill storybook. They can hear the story of the runaway bicycle at a giant talking book, visit Bill’s cubby, crawl through a ‘kid’s only’ way out and step through his fragrant garden. 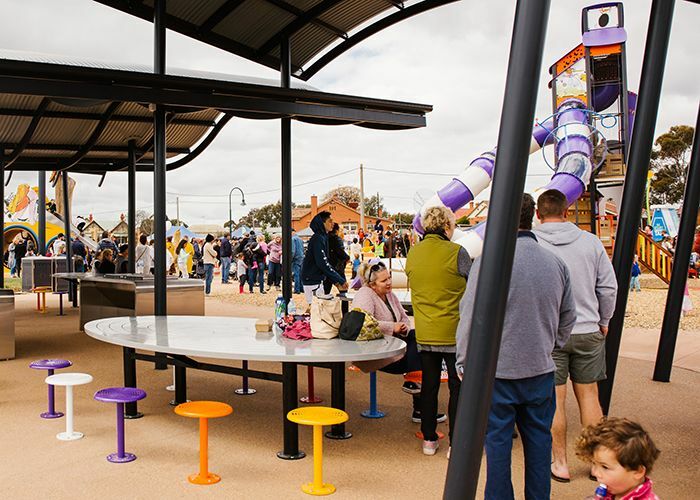 Three giant butterfly shelters shade a custom-designed table featuring the image of an eaglehawk, supplied by Street Furniture Australia, with colourful Cafe Stools. 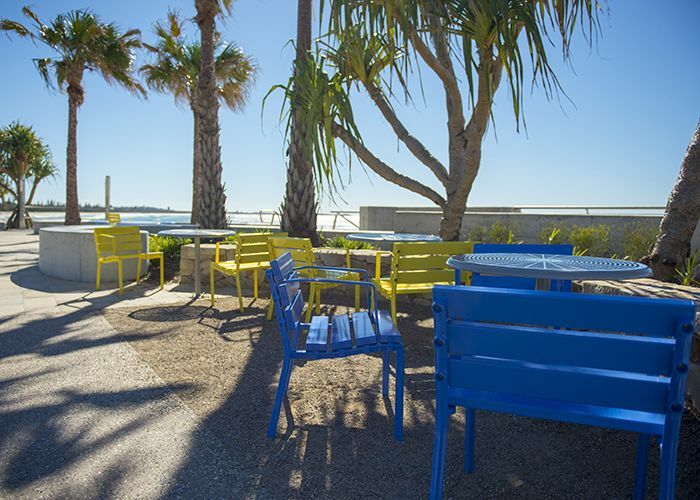 The designer has incorporated the slots of the Cafe furniture into the custom tables, tying them together as a suite. 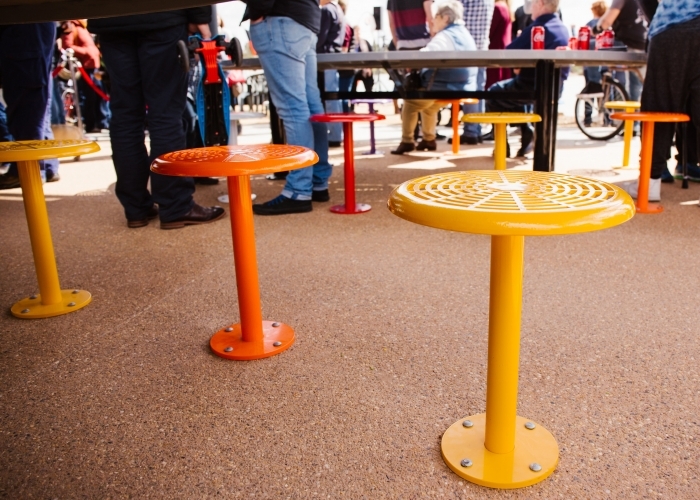 Throughout the park nine custom tables are set with 80 Cafe Stools in eight powdercoat colours: Safety Yellow, Sensation Orange, Bondi Blue, Telemagenta Pink, Lycra Strip Green, Dark Violet, Lobster Red and Pearl White, reflecting the colours of the illustrated book. “It was so important to get the size of the fountain right for children. Just watching how they interact with the fountain, especially the junior ones, gives them a sense of empowerment because they can do it themselves,” says Lantzsch. From the junior area, the play space narrative unfolds and follows the story towards more senior equipment and “a more helter-skelter type of chaos,” says Lantzsch. 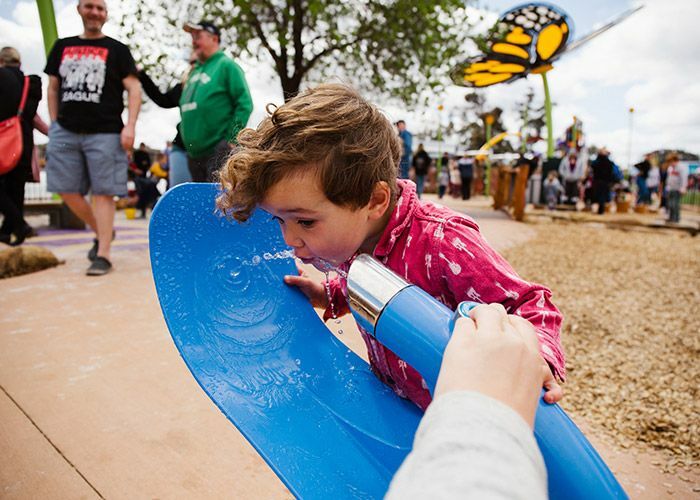 “The equipment becomes much bigger and bolder, as are the play opportunities – representing essentially Mulga Bill losing control of the bike and going down the hill,” he says. 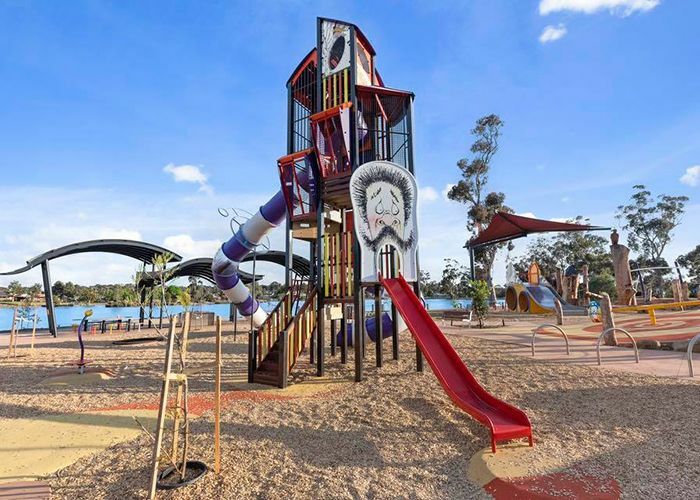 Older kids can climb the Mulga Bill tower to see the shape of the eaglehawk, then, like Bill, rush down the tubes and slide out of his surprised face. 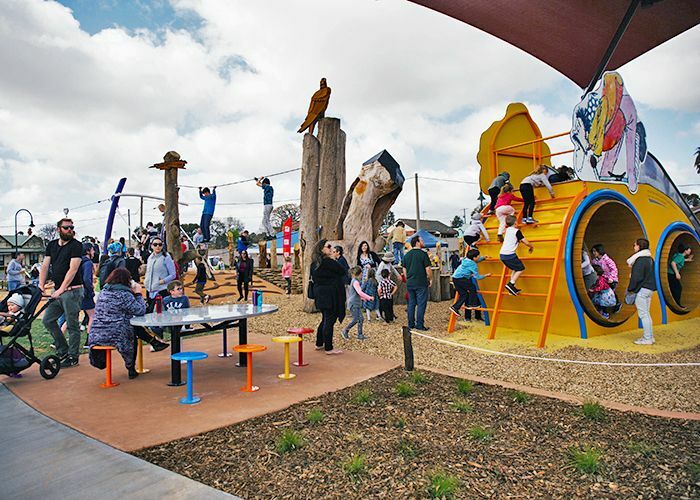 There are also twirling bicycles, a rope traverse, a tall stump kids can climb to reach a bell, a rubber nest mound and a double flying fox. The elements within each zone are designed to be multifaceted, for example, the Silver Streak, named from a line in the poem. This represents a giant bike ridden by Mulga Bill, with its two hamster-wheel combination and a trailing slipstream slide. Kids can tumble in two large wheels – side by side – and zip down together on the silver slide. 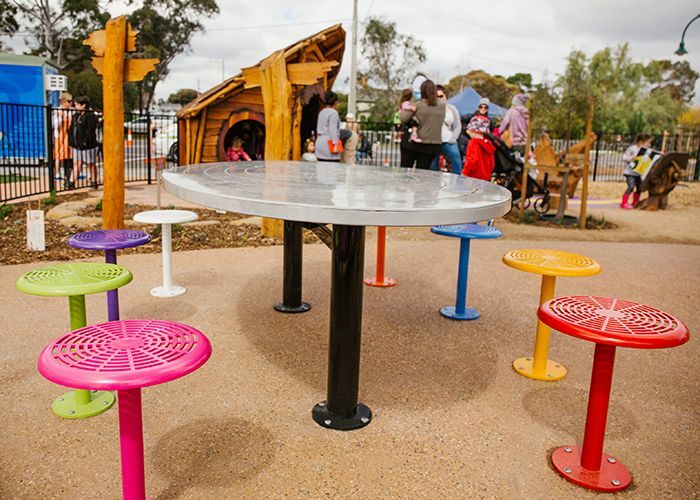 The play space was funded by the City of Greater Bendigo, with a $120,000 contribution from local community groups – Empowering Eaglehawk, Borough Club, Eaglehawk Rotary, Eaglehawk UFS Dispensary, Bendigo Regional YMCA, Y Service Club of Eaglehawk, Eaglehawk Lions Club, Villawood, Bendigo Bank, and the Family and Friends of Baby Zayden Veal-Whitting. “The Eaglehawk community know how to rally together, fundraise and support each other. They are the strongest of any community I’ve ever worked with,” says Lantzsch. 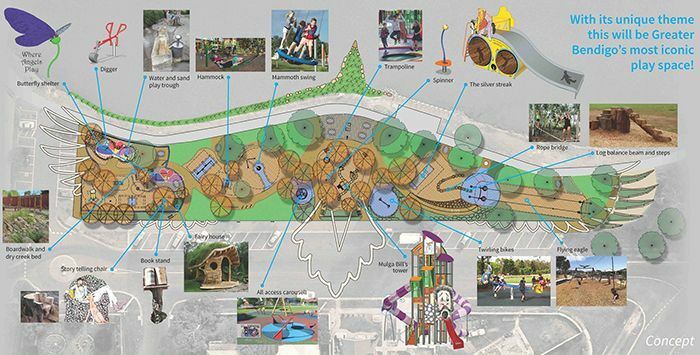 The park is built in the shape of an eaglehawk. Photo: Bendigo Aerial. 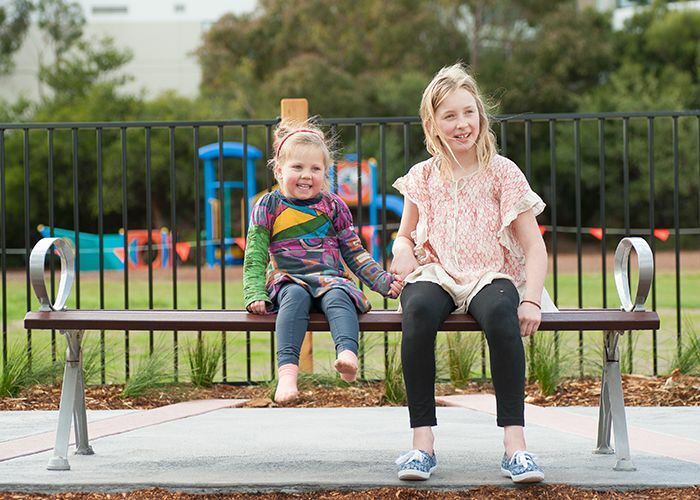 Video of families enjoying the park, by the City of Greater Bendigo.